I have the privilege of working with the science team on Leg II of the Autumn Bottom Trawl Survey aboard the NOAA Ship Henry B. Bigelow from September 27 – October 7, 2010. We left port on Monday, September 27 and have been conducting the survey in the waters of Southern New England. Fisheries surveys are conducted every spring and autumn in order to determine the numbers, ages, genders and locations of species that are commonly caught by the commercial fishing industry. The surveys are also carried out to monitor changes in the ecosystem and to collect data for other research. The scientists working on this leg of the survey are from Alaska, Korea, and New England. This ship works around the clock, therefore, we are divided into a day watch and a night watch, and we are all under the direction of the Chief Scientist, Stacy Rowe. I’m on the day watch, so my team processes fish from 12:00 noon until 12:00 midnight. In order to collect a sample of fish, our ship drags a net for twenty minutes in areas that have been randomly selected before the cruise began. After the “tow,” the net is lifted onto the boat, and the fish are put in a large area to await sorting. The fish move down a conveyor belt, and we sort the fish by putting the different types into buckets and baskets. Once, the catch has been sorted, we move the buckets onto a conveyor belt, which moves them to stations for data collection. Two people work at a station. 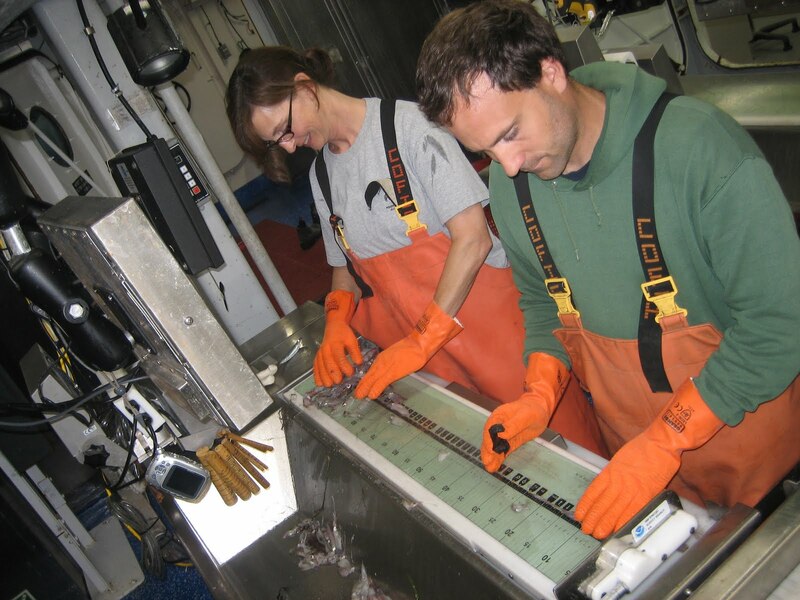 One is a “Cutter” and the other is a “Recorder.” The cutter measures the length and weight of the selected species of fish on a “fishboard.” This data is automatically entered into the computer system. Depending on the species, the cutter might also be required to take an age sample or a stomach sample. Age is determined by collecting scales or an otolith (sometimes called an ear bone), depending on the species. The cutter removes these and the recorder puts them in a bar-coded envelope to send back to the lab for later study. The cutter also removes the stomach, cuts it open, and identifies what the fish has eaten, how much, and how digested it is. All of this information is entered into the computer for later analysis. 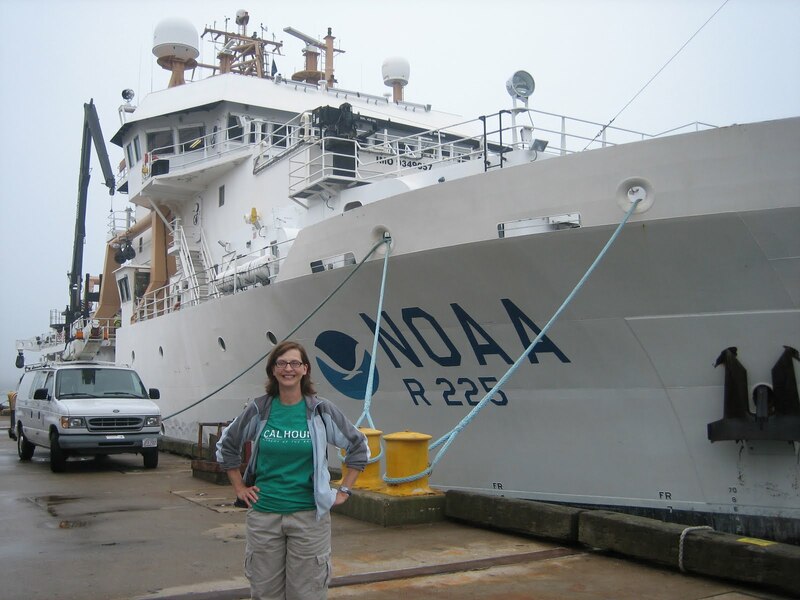 The information gathered during this cruise will give NOAA and other organizations valuable information about the health of the fish species and their ecosystem. I arrived the night before we left port, and I was able to spend the night on the boat. My stateroom sleeps two people in bunk beds, and each person has a locker in which to stow our belongings. The stateroom also has a bathroom with a shower. Right across the hall is the scientist’s lounge. It has two computers, a television, many books, and games. This is where we sometimes spend our time while we are waiting for a tow to come in. We spent much of the first day waiting to leave port. Once underway, some tests were conducted on the nets, and my Watch Chief showed me pictures of some of the common species we would see, explaining how to identify them. We began processing fish today. The first time the fish came down the conveyor belt, I was nervous that I wouldn’t know what to do with them. It worked out fine because I was at the end of the conveyor belt, so I only had to separate the two smallest fish, Scup and Butterfish, and Loligo Squid. After my first try at processing, I felt much more confident, and I even was able to tell the difference between Summer and Winter Flounders. One faces to the right and the other faces to the left! 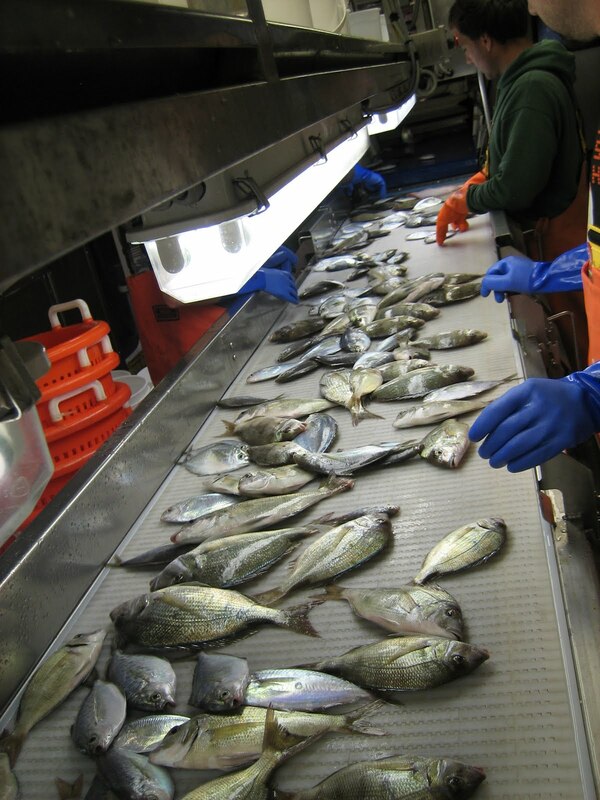 This entry was posted in 2010, Barbara Koch, NOAA Teacher at Sea and tagged Autumn Bottom Trawl, converyor belt, data collection, flipboard, Henry Bigelow, New England, otolith, sorting, tow. Bookmark the permalink.